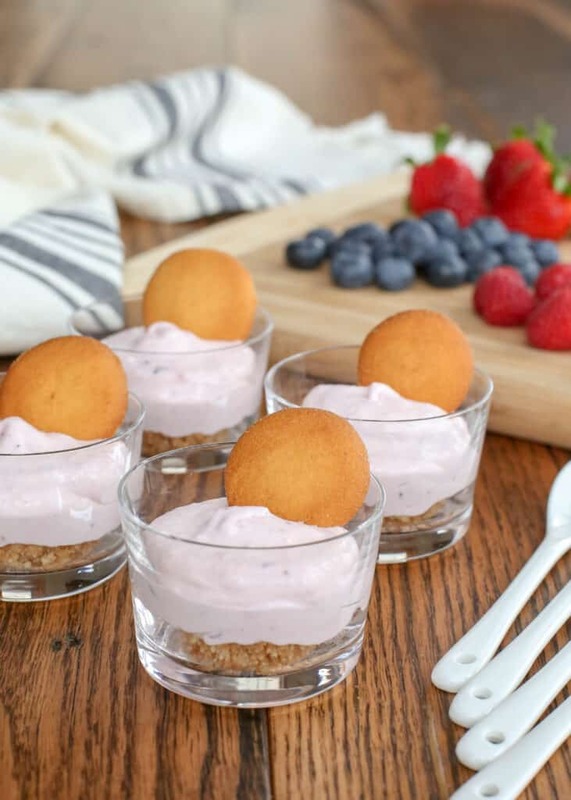 Berry Cheesecake Mousse Cups start with a buttery NILLA wafer crust. The crust is layered with fluffy whipped cheesecake mousse and then topped with plenty of fresh fruit. This dessert is perfect for Easter or any other spring and summer event when berries are at their best. 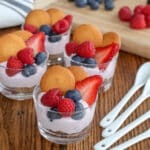 I love the bright berry flavor and the crunch of the crust works perfectly with the creamy mousse. When NILLA wafers asked me to create a recipe to highlight how awesome their wafer cookies are, I just grinned. Could there be a more fun brand to partner with for a recipe? My first memory of NILLA wafers is probably from around the age of 5. I was sitting in a classroom and I was beyond excited with our snacks that day. I’m pretty sure there was a cup of juice and a couple of NILLA wafers in front of me and it just thrilled my dessert-loving heart. My desserts and sweet snacks may have gotten a little more sophisticated over the years (okay, maybe not always) but there’s still something immensely satisfying about the classic vanilla flavor that shines through with the original NILLA wafers. Fortunately, they’re every bit as popular today as they were years ago and you can find NILLA wafers at your local Kroger store. When I started thinking about flavors to pair with these crispy wafer cookies, I immediately thought of cheesecake. But I wanted something extra fun for spring and for our Easter dessert. There aren’t even words for how much I adore this lightly whipped strawberry cheesecake mousse. I’ve made endless variations of it and so many of my favorite no-bake recipes start with these basic ingredients. Cream cheese + heavy cream + sugar? There’s honestly nothing that can go wrong with that combination. When you add in the awesomeness of a classic NILLA wafer, you’ve got a winner of a dessert. 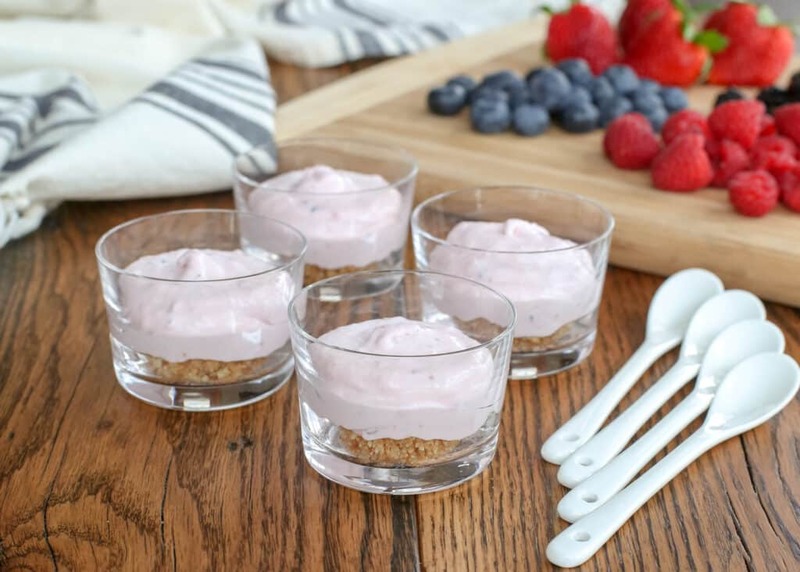 For these Berry Cheesecake Mousse Cups, I added a generous handful of fresh berries and a squeeze of fresh lemon juice to that fluffy whipped mousse. Melted butter and crushed NILLA wafers form the simple crust. Top each little dish with another wafer cookie or two and a handful of fresh berries. You’ll have a winner of a dessert on your hands in no time. KITCHEN TIP: Keep in mind that the sweetness of the fresh berries will determine the flavor and sweetness of the dessert. Place the berries and lemon juice in a small food processor or alternatively in a small mixing bowl. Pulse with a food processor to smash and puree the berries or smash them with a potato masher or a fork until pureed. Place the cream cheese, sugar, and salt in a mixing bowl and beat with an electric mixer until smooth, about 2 minutes. Add the berry mixture and beat to combine. Add the cream and beat again, until smooth and fluffy, about 3 minutes. Place the NILLA wafers in a freezer zip-close bag, remove excess air, and seal. Smash with a rolling pin or the flat side of a measuring cup until fine crumbs form. Place the butter in a small glass bowl and melt in the microwave, this should only take about 20 seconds. Add the wafer crumbs to the butter and stir with a fork to combine. Divide the buttery crumbs into small serving dishes and press lightly with your fingers to form a crust. Spoon the berry mousse mixture over the crusts. 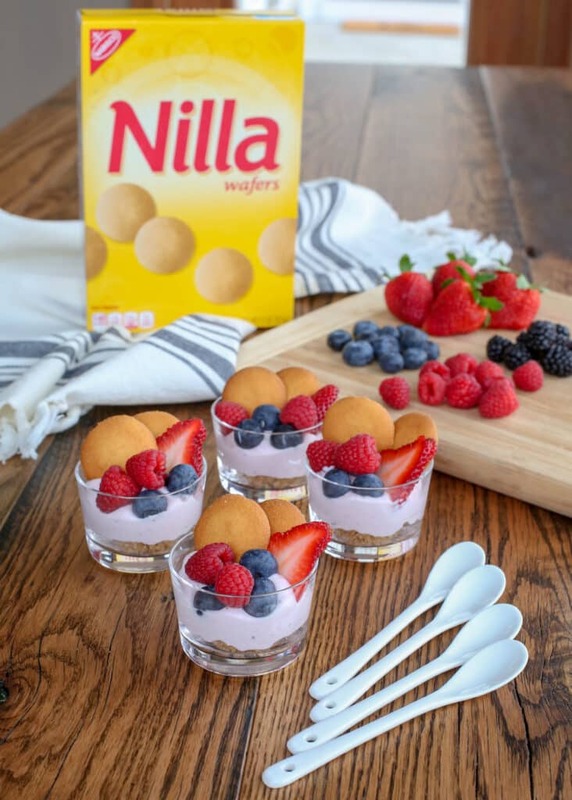 Top with NILLA wafers and the berries of your choice. Serve immediately or refrigerate until ready to serve. 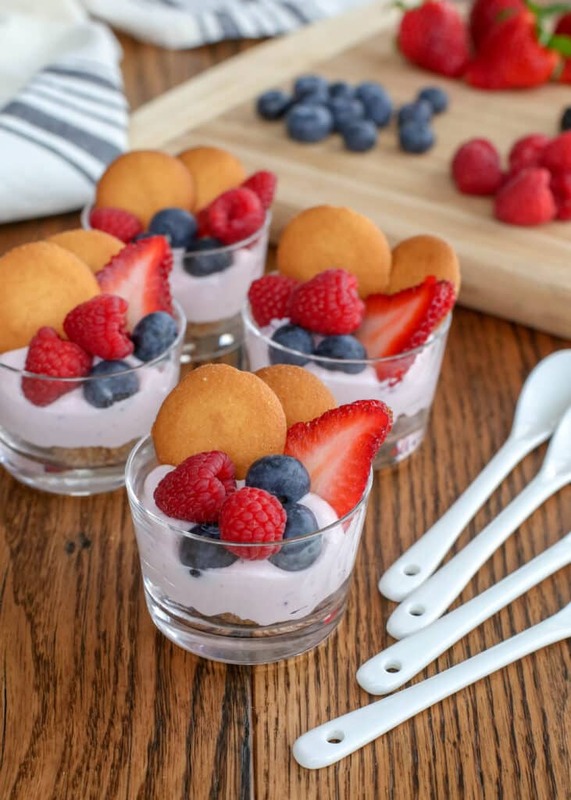 Creamy berry mousse, fresh berries, and a crisp NILLA wafer crust make up these sweet treats! Place the NILLA wafers in a freezer zip-close bag, remove excess air, and seal. Smash with a rolling pin or the flat side of a measuring cup until fine crumbs form. Place the butter in a small glass bowl and melt in the microwave, this should only take about 20 seconds. Add the wafer crumbs to the butter and stir with a fork to combine. Divide the buttery crumbs into small serving dishes and press lightly with your fingers to form a crust. Spoon the berry mousse mixture over the crusts. 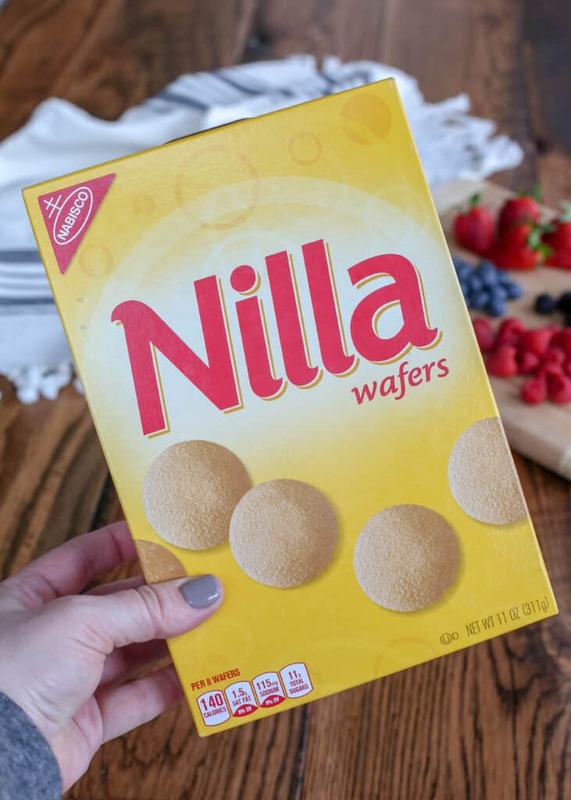 Top with NILLA wafers and the berries of your choice. Serve immediately or refrigerate until ready to serve. Keep in mind that the sweetness of the fresh berries will determine the flavor and sweetness of the dessert. Disclosure: I’ve partnered with Kroger and NILLA Wafer to share this recipe with you. Thanks for supporting the brands that make this website possible. As always, all thoughts and opinions are my own. I'm so very glad you enjoyed the recipe, Lee!